Flipside sources report Morty is “back at it again” and this time with an even less prepared speech. 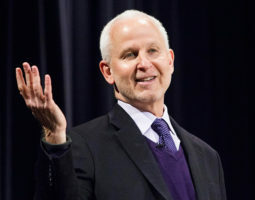 On Tuesday, University President Morton Schapiro began his introduction for Margaret Atwood’s One Book Keynote with a brief, but unsuccessful, foray into comedy. “Margaret Atwood’s book, ‘The Handmaid’s Tale, shows us a dystopian America where women’s rights have been so thoroughly stripped away that for many of them their only role is procreation. Many argue that today’s America is not that far away from Offred’s America, although maybe then it would be called ‘Ofmorty’s America then, ay?” said Schapiro. Schapiro’s joke was met with silence. At most there were a few sharp inhales, but that was as close to laughter as Schapiro got. On the whole, people were not enthused by Schapiro’s choice of setting for comedic liberty.